I just finished giving the course "Beginner Cake Decorating" to 4 lovely ladies. It ran Tuesday evenings from 7-9 at the local junior school for 3 weeks. This is the cake I made to demonstrate the star tip, the drop flower tip, the leaf tip, the writing tip and the techniques to torte and cover a cake in buttercream icing. 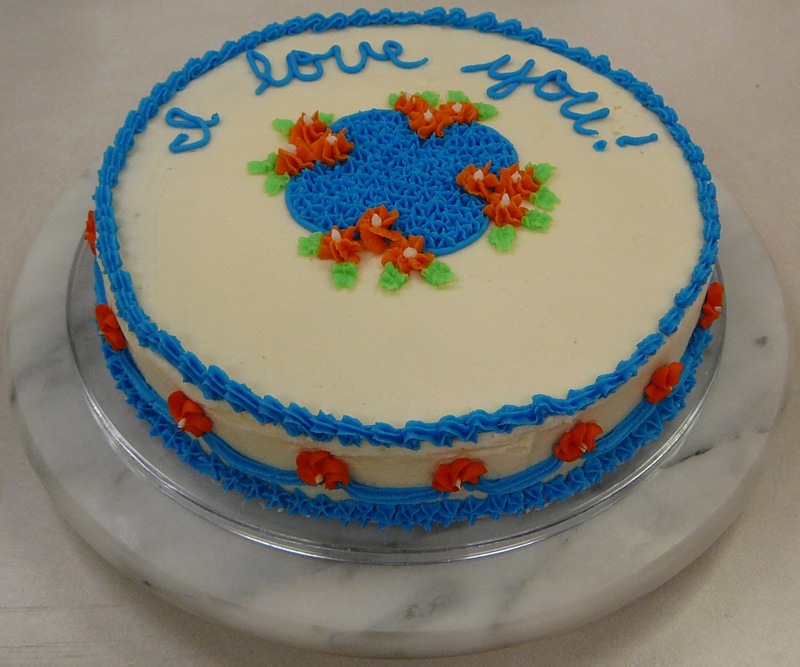 The orange flowers around the sides of the cake were made with Royal Icing. Everything else was buttercream icing. It was a chocolate cake. Tomorrow I will show you what cute thing I made with the leftover icing! I'm proud of my students. I think they did a great job. Like this cake says, Happy Day.